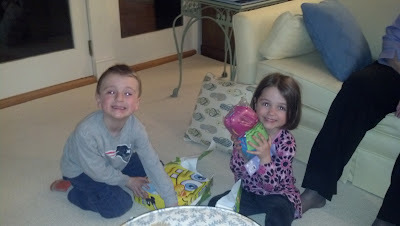 Had another great Easter this year. The kids slept in until 7:45 which meant I was able to drink an entire cup of coffee in peace and quiet before they got up. 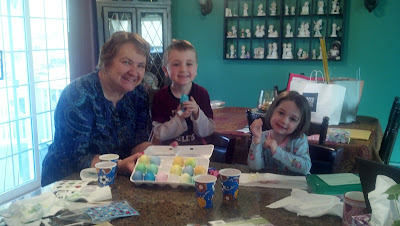 After baskets and an egg hunt with Babci we went to Karen and Jim's for brunch and another egg hunt. Beautiful day with lots of "cousins". Happy 4th birthday to my super smiley nephew Joshie! 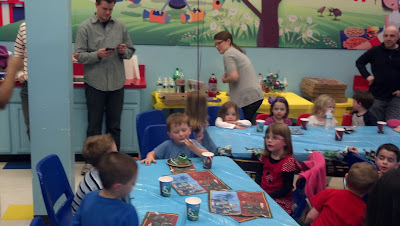 Always a fun time at cousins birthday parties especially when they are at a bouncy house. And very proud of Chris for finding a way to watch the basketball game even at a birthday party (can you hear the sarcasm?). Another fabulous time in Atlantic Beach and Aunt Donna Jo and Uncle Hutch's (new!) house. We never leave without a bunch of presents and a trip to the beach. I didn't get any pictures of Joanna's shower so I would love if some would be sent to me so I can update with pictures of what the girls did with Joanna while the boys went to the beach. Beautiful weekend! We started the Easter weekend at Babci's house and we love that, especially with more warm weather to play in the backyard! We dyed eggs and dug worms. Who knew how brave Rich would be to hold bugs when he has gloves on. We were then off to Long Island for Joanna's shower. As we waited at the mall for Chris to pick us up I tortured my kids by making them take a picture with the Easter bunny. 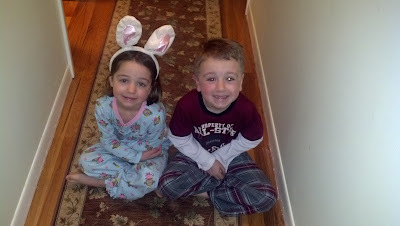 All the other kids were so happy to see him dressed in their Easter best. 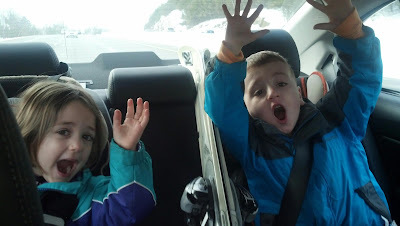 My kids were filthy and Angela screamed! Can't blame them for hating adults dressed in costume. Never a dull moment! Rich has been eating like crazy recently! 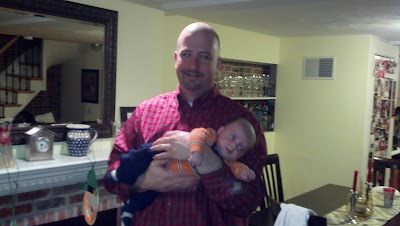 Sunday, I would swear he ate more than me at lunch (PF Changs- his favorite hot and sour soup!) and then was begging for dinner when the rest of us were still full. Well this morning we saw his growth spurt. Check out these pants! He wore them last Monday for gym. 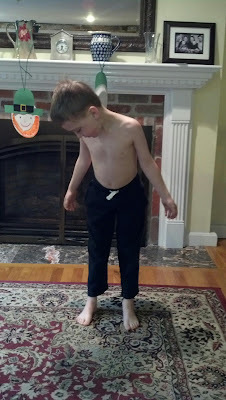 They were certainly not long last week, but I would never have sent him in pants this short. I would swear he grew 2 inches just this week! Another beautiful day to be outside! 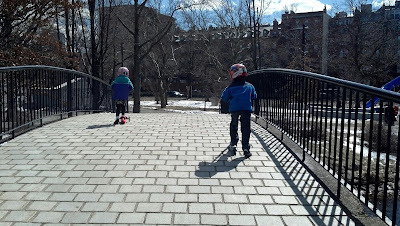 After Mass we decided to scooter to our favorite "big kid" playground on the Esplanade. It is always so nice on the river. It is funny to be playing in the snow on a sunny spring day. Even Regina couldn't ask for more. Ski day with just Mommy! I just couldn't resist going skiing on a weekend we didn't have much to do. It just won't stop snowing so we may as well enjoy it! Chris wasn't interested because he hurt his knee but we didn't let him bring us down. I did actually have help (a lot) because our friend Lisa came as well. I love her because she never says no for any crazy idea. We decided on Pats Peak because it is close and kid friendly. What a great choice! The kids tore this place up. We went on every trail that wasn't a black diamond. Ang is an animal! Woods trails, LOTS of jumps, we did it all with no breaks. I had an unforgettable day with the kids. 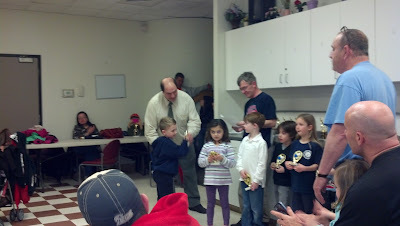 You would have never known they were only 6 and 3. And check out the picture of Rich with only one ski. Other one fell off getting on the lift. He thought that was pretty cool. We were so excited to have Bradley (oh and Erin) come for dinner on a work day. We could get used to Erin not working! The Superman hold works on Bradley just like it did with my kids. 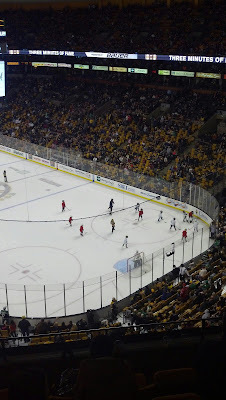 A fun Bruins game with friends (Colton and Riley). Also this was the game Rich's hockey team played in after the first period. We are so proud of them. Lots of pre-game getting psyched up and lots of fun! 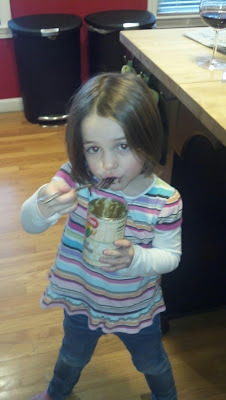 My little Polish girl eating sauerkraut straight from the can! 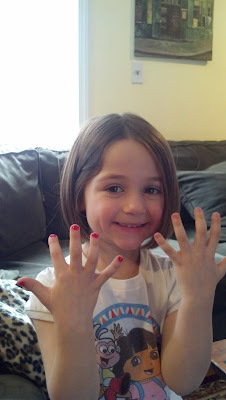 Just like her Mom. 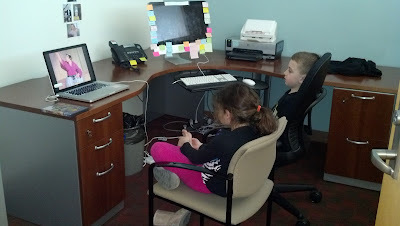 Since the kids have ANOTHER snow day it became an impromptu "take your kid to work" day.